n any serious band's to-do list is the in-store appearance. It's part of the trifecta of touring, the basis for the bling-bling (in a manner of speaking) and a way to put butts in every seat and a beer in every fist. See, it's like this: if you're touring but nobody knows who you are, you want to do something to ensure that more than the other bands are there to see you play. To this end, you hope to have a little press, a little radio and an in-store appearance. It gives people a chance to see your stuff for free (in the afternoon, no less) and decide if they want to check you out in a club later that night. More importantly, they might buy your record. Two drum-and-guitar duos played in-store shows on the same Saturday in P-town last month, and the results ended up mixed. Coincidentally, both duos were just about 30 minutes late for their sets. I guess certain rock traditions must always be upheld. First, Gravity and Henry took over the Music Millennium on Northwest 23rd Avenue. I thought it'd be nice to check up on them as they go out touring in support of Sputnik: Traveling Companion, their new CD. But because of the spaciness of their music, I missed a few details. That is, I think they said car trouble was what kept them from hitting the stage on time. Suuurrre. The spare setup didn't yield their stripped-down sound: a sequencer, frenetic drumming and strumming, and multiple stomp-boxes attested to that. 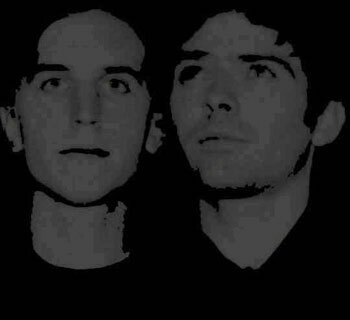 But gone are the jagged, pizzicato timbres, the Eastern leanings and the rhythmic experimentations of their earlier stuff. These things have been replaced (mostly) by lots of acoustic-guitar strumming and relatively straight-ahead funk beats, as well as more introspective, singer/songwriter-type crooning. While the changes are not in and of themselves bad, with Gravity and Henry, they look like attempts to fit in  and don't seem to embody as succinctly the original concept of their music. Their unapologetically loose performance had drummer Jarhid frequently checking his computer monitor to see where they were in any particular song. It's forgivable, even amusing, but it certainly mitigated my enjoyment. Their crew of die-hards enjoyed themselves, but my boat didn't float. Maybe a couple weeks playing in-stores and smoky bars across the NW will settle Gravity and Henry out a bit. They quickly reappeared to start ripping it a half-hour tardy. I forgave them because they're far from their hometown of Akron, Ohio. And, like everybody says, they freaking rock. 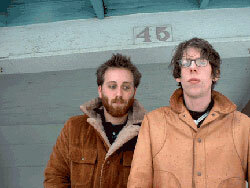 As stable-mates of gutbucket blues label Fat Possum, the Black Keys' sometimes-rubbery, always-rugged indie-swamp blues-rock might cast them in a cynical grab for an even more hip, younger audience by the label. But their sincere fire, freely displayed knowledge of what made them, and spooky old-soulness put them on entirely another level. The ragged cry in Dan Auerbach's gritty vocals seems part rock 'n' soul creation and part channeling  with the edge going to the supernatural aspect. Yes, they fall easy prey to another cliché of the genre; this stuff be old as the hills, rooted to the bedrock, tendrils going into the past, authentic to its roots (even though the guys, including drummer Patrick Carney, are only in their early 20s!). Surely a large part of the sound's authenticity is because Dan learned his chops from James "T-Model" Ford in the rib-pits and juke joints of ole Miss. This boy doesn't need to be told to pay his dues. The short, sweet set inspired more than a few to check out the real deal later that night, just the way these in-stores are supposed to work. How can the kids resist the frenzied, red-faced, sweating, pummeling beats and angular post-punk quagmire guitar? How can they deny the appeal of the locomotive songs, swinging from front porch hypno-riffing/chanting to brutal rock howling? How can anyone deny the Black Keys mastery of the brilliant "She Said, She Said," which the group adopts as one of its own? Two in-stores, two results, with the edge going to the Keys. In either case there is progression, and the choice is laid out, conveniently at your local record store, for you to make.